Stephanie Sykes visits Santa Monica Mosuem of Art’s tiny, tucked away project space quietly housing the debut solo show of Iranian-American Artist Samira Yamin. 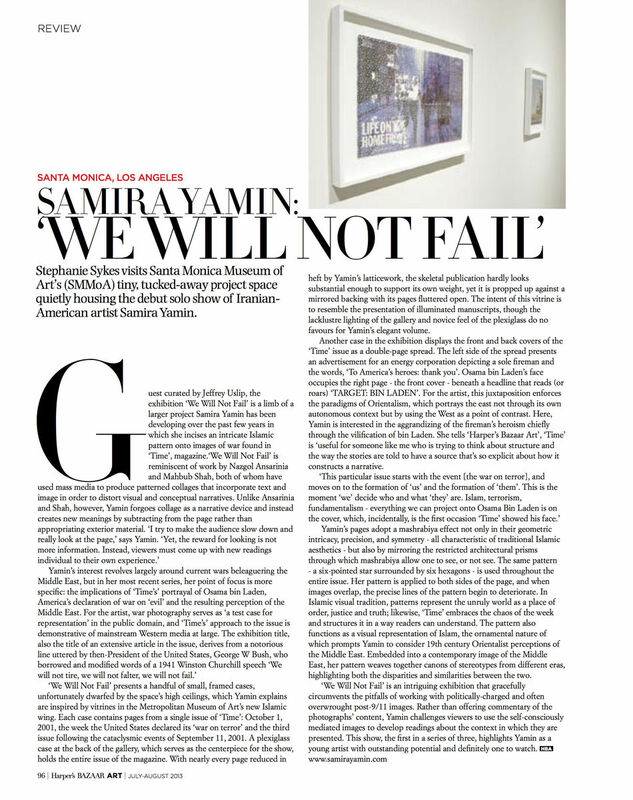 ‘We Will Not Fail’ presents a handful of small, framed cases, unfortunately dwarfed by the space’s high ceilings, which Yamin explains are inspired by vitrines in the Metropolitan Museum of Art’s new Islamic wing. Each case contains pages from a single issue of ‘Time’: October 1, 2001, the week the United States declared its ‘war on terror’ and the third issue following the cataclysmic events of September 11, 2001. A plexiglass case at the back of the gallery, which serves as the centerpiece for the show, holds the entire issue of the magazine. With nearly every page reduced in heft by Yamin’s latticework, the skeletal publication hardly looks substantial enough to support its own weight, yet it is propped up against a mirrored backing with its pages uttered open. The intent of this vitrine is to resemble the presentation of illuminated manuscripts, though the lackluster lighting of the gallery and novice feel of the plexiglass do no favors for Yamin’s elegant volume. Another case in the exhibition displays the front and back covers of the ‘Time’ issue as a double-page spread. The left side of the spread presents an advertisement for an energy corporation depicting a sole reman and the words, ‘To America’s heroes: thank you’. Osama bin Laden’s face occupies the right page - the front cover - beneath a headline that reads (or roars) ‘TARGET: BIN LADEN’. For the artist, this juxtaposition enforces the paradigms of Orientalism, which portrays the east not through its own autonomous context but by using the West as a point of contrast. Here, Yamin is interested in the aggrandizing of the reman’s heroism chiefly through the vilification of bin Laden. She tells ‘Harper’s Bazaar Art’, ‘Time’ is ‘useful for someone like me who is trying to think about structure and the way the stories are told to have a source that’s so explicit about how it constructs a narrative. Yamin’s pages adopt a mashrabiya effect not only in their geometric intricacy, precision, and symmetry - all characteristic of traditional Islamic aesthetics - but also by mirroring the restricted architectural prisms through which mashrabiya allow one to see, or not see. The same pattern - a six-pointed star surrounded by six hexagons - is used throughout the entire issue. Her pattern is applied to both sides of the page, and when images overlap, the precise lines of the pattern begin to deteriorate. In Islamic visual tradition, patterns represent the unruly world as a place of order, justice and truth; likewise, ‘Time’ embraces the chaos of the week and structures it in a way readers can understand. 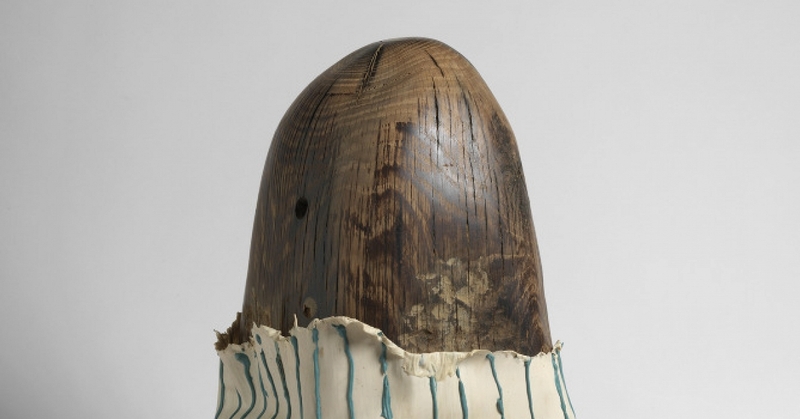 The pattern also functions as a visual representation of Islam, the ornamental nature of which prompts Yamin to consider 19th century Orientalist perceptions of the Middle East. Embedded into a contemporary image of the Middle East, her pattern weaves together canons of stereotypes from different eras, highlighting both the disparities and similarities between the two. ‘We Will Not Fail’ is an intriguing exhibition that gracefully circumvents the pitfalls of working with politically-charged and often overwrought post-9/11 images. Rather than offering commentary of the photographs’ content, Yamin challenges viewers to use the self-consciously mediated images to develop readings about the context in which they are presented. This show, the rest in a series of three, highlights Yamin as a young artist with outstanding potential and definitely one to watch.